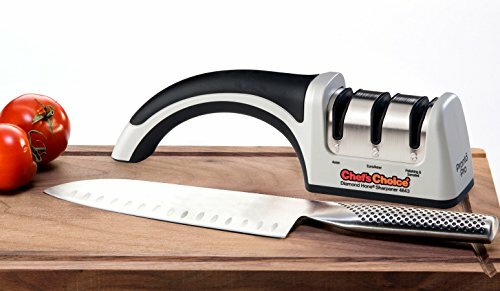 Chef's Choice ProntoPro Diamond Hone Knife Sharpener #4643 is a perfect manual sharpener for those who own Asian and European/American style knives and want to quickly and easily apply a superior, shaving sharp edge! Sleek and highly-styled, it’s our fastest manual sharpener yet for applying 15 degree edges for Asian style knives and 20 degree edges for European/American style knives. Using precise angle guides, 100% diamond abrasive wheels and our acclaimed CrissCross sharpening technology, it provides a super sharp, durable, arch shaped edge with lots of “bite.” The secret is in the 100% diamond abrasive wheels which sharpen simultaneously “into” and “out-of” the edge for a superior burr-free edge that cuts effortlessly. Separate honing stage polishes the edge for flawless performance. The ProntoPro sharpens all quality knives including straight edge household and kitchen knives, Santoku, sports and pocket knives, as well as serrated knives. Engineered and assembled in the U.S.A.